Jess says that when they moved into their house, the half-bath/laundry room was “so bad we just had to laugh about it.” The mural on the walls extended all the way to the ceiling, complete with blue skies and birds, which, while well painted, weren’t really their style. 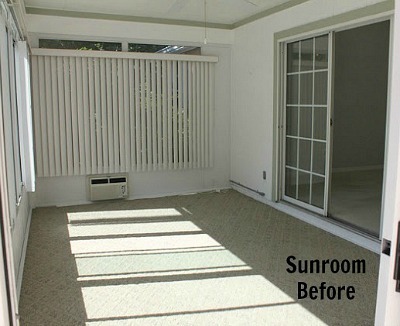 She says, “I am so happy with how this little room turned out.” I can see why! Thanks to Jess for sharing the remodel with us. For all the photos and details, visit her blog Home with Baxter. Lovely transformation! Best, Beth C.
I really like her use of the bead board in the laundry room. She had it on the lower walls as well as behind the washer and dryer. I think painting the bead board behind the washer and dryer the same color as the wall color in the bathroom adds a nice balance of texture and interest. Very clean, open and inviting. Well done! Beautiful! I LOVE the wall colour! 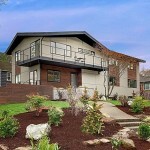 Congrats on a fabulous reno!! Gorgeous! That’s pretty much exactly what I want to do with our main bathroom (minus the laundry nook). It looks fresh, clean & bright! Love the marble hex! I love the light fixture in the bathroom. Very unique. Great job. 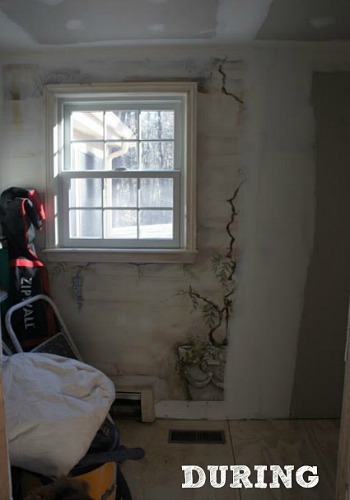 I can see why you’d laugh at the before bathroom. Yikes. 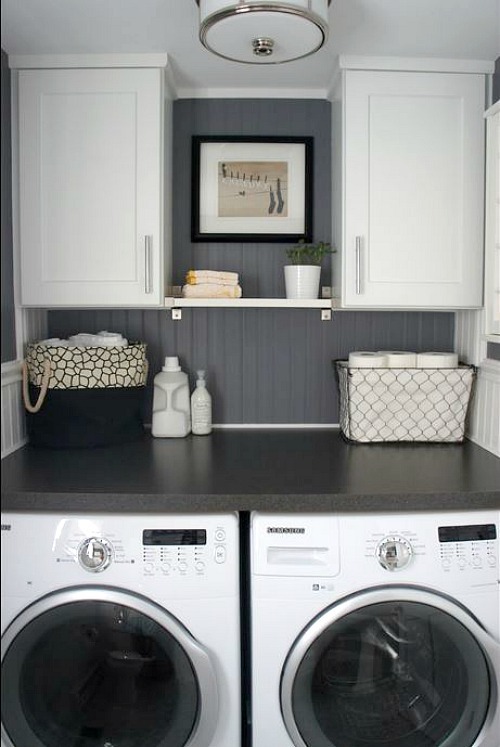 You gave me some ideas for my laundry room remodel too! Wow that came out gorgeous! Gorgeous! I’m doing something similar in our half bath with white wainscoting and navy walls. Lovely! Somewhere, there’s a really sad artist. I agree. I thought the original bathroom was pretty and feminine. And it had character. It could have used some new fixtures, but the new bathroom looks boring, sterile and so “Pottery Barn”. Funny. Then I read someone wrote “they have the same Pottery Barn light fixture.” I would have kept the mural. I’m glad I’m not the only one. I love the mural, & feel it’s a pity it wasn’t appreciated. 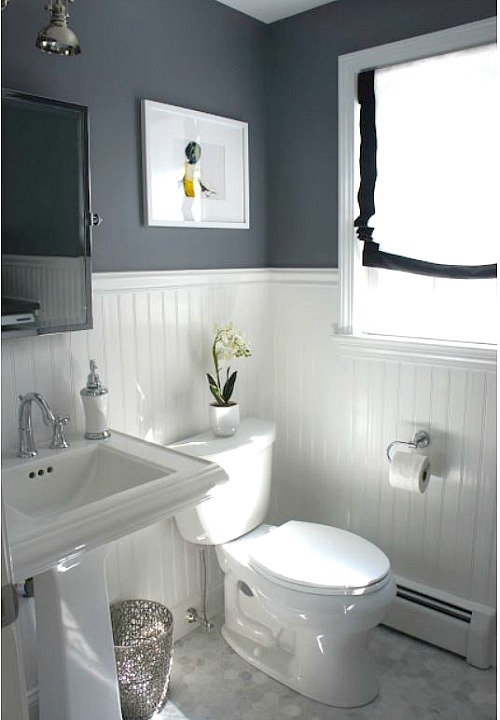 The bead board wainscoting is gorgeous too, but that dark gray doesn’t work for me at all. I, too, liked the mural. ha I think they could have just changed the vanity and especially the gold faucet, etc. and it would have been pretty. But, then, I’ve never been trendy…. omg, i loved the mural!!! i would not have changed it!!!! Wow! What a great transformation. The bathroom actually has character now and I’m sure it gets used a lot more. I’m chiming in too, to say that the mural had a certain charm. Still, I love what they did with the laundry. 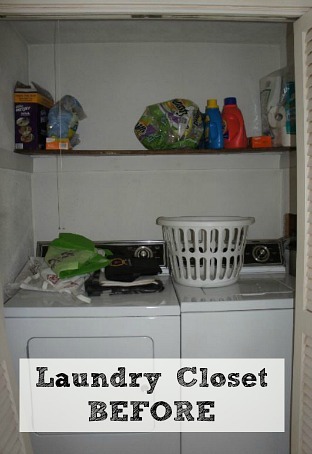 My own washer and dryer are in a closet just like that and now I feel inspired! The way it was before was just…awful. (No offense to the artist.) But it looked dirty and grimy with that tacky mural. The new decor is crisp and clean — exactly what you want in a bathroom! Love, love, love it! The makeover looks lovely! 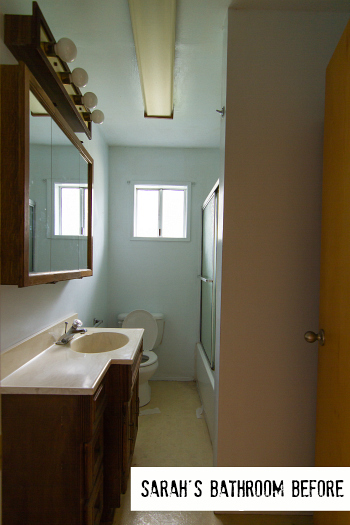 When I saw the before photo, my mind went back to all the bathrooms I’ve painted. 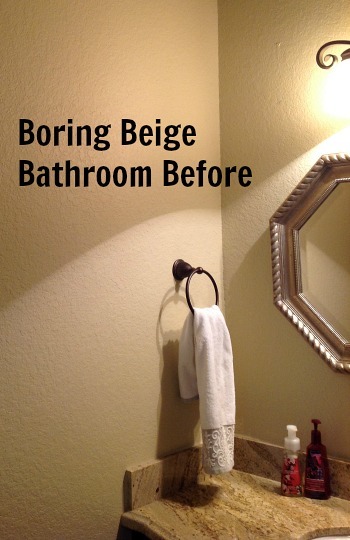 It’s hellish enough to paint a bathroom….but to put that kind of effort into it! It seems sad to cover beautiful artwork but I think most people would understand why Jess did. I once moved into a home in which the nursery had been painted with large Disney characters. Although the art was well done, the walls themselves hadn’t been freshened up with new paint. The effect was grim and sad. Needless to say, this was the first room to be done. You are right: To each their own. We have to live in our homes and be comfortable in our environments. When I was a newlywed and trying to set up and decorate my new home, my in-laws were downsizing. They offered us their very expensive living room furniture, including a rug on which I know they spent $10,000+. While I greatly appreciated the offer, their style just wasn’t mine, and I knew I wouldn’t be happy with their furniture in my daily life. (Note: their offerings weren’t family heirlooms, which I would not have rejected!) One of the most difficult conversations I’ve had with my mother-in-law was the one in which I encouraged her to sell her living room furniture in their upcoming estate sale so it could go to a family who would appreciate it more than I would. I also explained that I wanted furnishings that could better withstand the grandchildren I hoped she would soon have! So, my comments about the artist were simply relating to what my mother-in-law must have felt when I told her I didn’t want her furnishings. In hindsight, though, it didn’t damage our relationship, and she and I have grown to appreciate individual styles in decor, as a result! I’m sure the mural artist would feel the same. Enjoy your new space! Hi Angela, Thanks for your follow-up. I didn’t take offense to what you said, but I do appreciate you taking the time to explain. You actually helped me realize how insensitive I was being to the artist in my blog post. I certainly wouldn’t want her to feel bad if she ever saw it. For me, this was a good reminder that there are actual “people” behind these posts/comments/pictures and how important it is to be respectful of other people’s tastes and opinions. Thank you! Quite a transformation. It’s beautiful! I loved the original mural, too. I really like the transformation also. Great job. 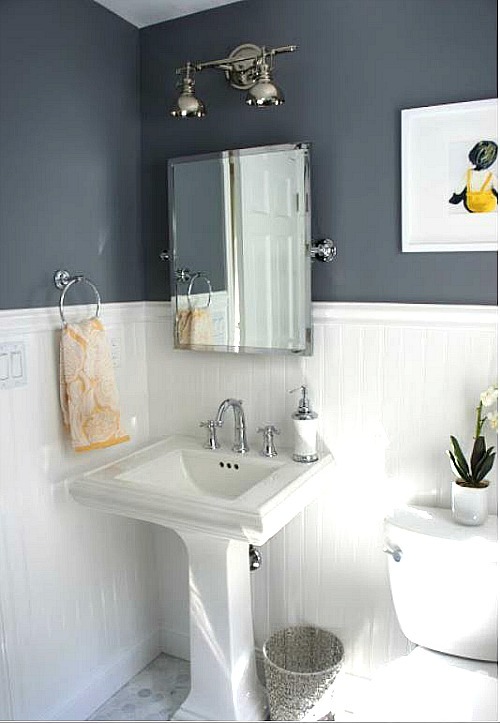 I like the floors and the beadboard and have thought to use the beadboard in my bathroom when I get around to remodeling. As for the floors they are lovely and I’ve seen a ton of remodels using the Carrara marble–not so much used in flooring, but more in kitchens. I wonder how practical it is as I’ve heard that marble is not only high maintenance, but also not very resilient, although very lovely. I haven’t researched it enough or had any practical experience with it. It’s a nice look–simple and fresh. The original mural was pretty, but the transformation is nice too and I agree with the sentiment that a home should be a reflection of you even if that tends to change and can get expensive too. 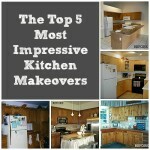 I look at these new remodels and wonder how quickly they will soon be passe. Hello Julia! Nice post and interesting comments! 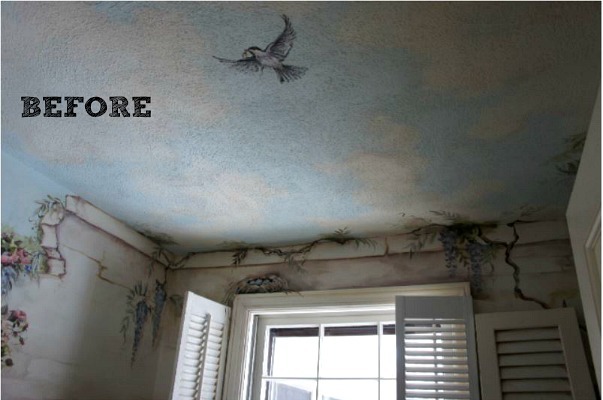 I agree that the “before” has a lot of personality and I love that bird on the ceiling but present owners must give the look and style they prefer and the redo is wonderful too. Did you get rid of the muriel? That’s a shame, it was gorgeous. 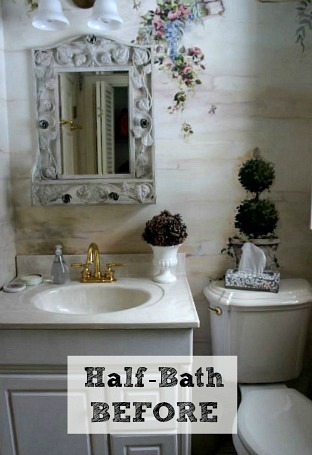 This has got to be one of my favorite bathroom make-overs. The bathroom part is exactly like what I want to do with my bathroom (but a lighter blue/grey paint color). This bathroom is almost identical to the size we have as a powder room, which is why I’m so excited to see this. I love the marble touches on the floor–everything looks so clean and fresh! Hi, great job on the reno! We love the gray color on the wall, what color did you use? It is beautiful! I love that gray on the wall and would like to use it in my bedroom. You said it is “sea salt” by Sherwin Williams but when I looked up that color, it’s totally different. Could it perhaps be a different color? I thought when I ready the comments the other day it was a Benjamin Moore color? Thank you! Oops. That was totally my fault. When that comment came in recently I thought it was with a batch of others responding to my living room before and after who were asking about the paint color. This is definitely not Sea Salt. I’m afraid I don’t know what this one is, but if you follow the link to her blog maybe she mentions it there or can tell you. Sorry for the mix-up! Love both rooms! Thanks for the inspiration. 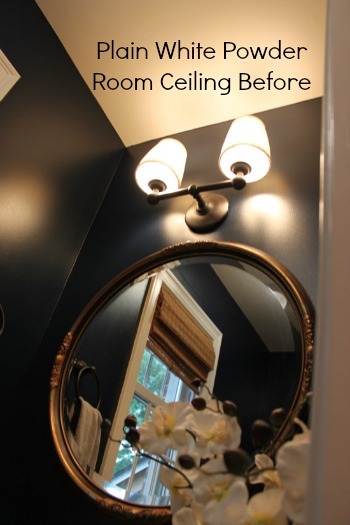 Where did you get your laundry room ceiling light?